Studies by the experts who plan and operate the electricity grid show that much higher levels of renewable energy can be achieved reliably, while significantly reducing carbon emissions. We can significantly ramp up renewable energy and improve the reliability and resilience of our electricity system against the risks posed by extreme weather and climate change. How do we know? We are already doing it today. 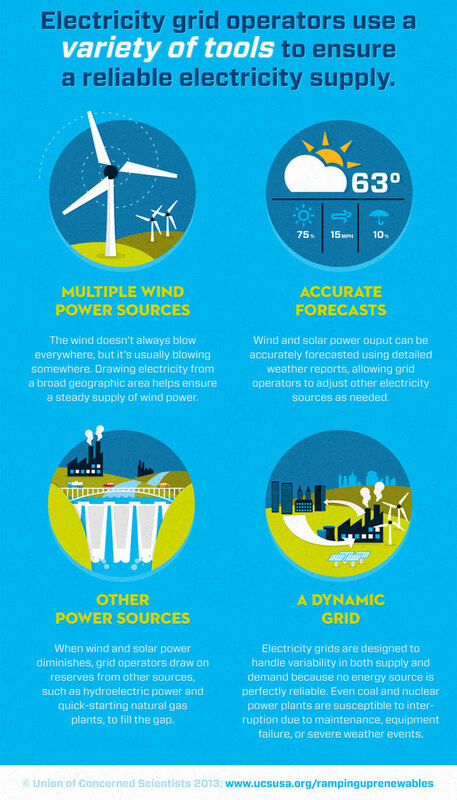 Wind energy provided 31 percent of new U.S. electricity generating capacity from 2009-2013. Solar accounted for an average of 16 percent of new electricity generating capacity installed annually in the U.S. from 2010-2013, and nearly 30 percent in 2013 alone. Nine states produced more than 10 percent of their electricity from wind energy alone at the end of 2013, with wind generating over 15 percent of power in six states, and more than 25 percent in two states. Utilities and grid operators use a variety of existing tools and practices to accommodate for the growth of wind and solar energy, while maintaining a reliable flow of electricity during those times when the wind does not blow or the sun does not shine – just as they have always done to manage everyday changes in energy supply and demand. The authorities responsible for operating the nation’s power grid – regional transmission organizations and independent system operators – have all published or participated in studies evaluating how increased renewable energy supplies would affect the electricity system. These studies have overwhelmingly shown that higher levels of renewable energy can be achieved regionally without affecting the reliability of electricity supplies. They also highlight that ramping up renewables can result in significant cuts in global warming pollution. PJM Renewable Integration Study: A 2014 analysis found that the 13-state PJM Interconnection region can get up to 30 percent of its power from wind and solar and reduce carbon emissions by as much as 40 percent, with expansion of transmission and minimal additional backup supplies. New England Wind Integration Study: A 2011 ISO New England study found that wind energy could meet 24 percent of the region’s electricity requirements in 2020, with sufficient transmission upgrades, while reducing carbon emissions by 25 percent. Western Wind and Solar Integration Studies: A 2010 National Renewable Energy Laboratory (NREL) analysis of the 11-state Western Interconnection region concluded that in 2017, “The integration of 35% wind and solar energy into the electricity power system will not require extensive infrastructure if changes are made to operational practices.” Ramping up renewable energy to that level would reduce carbon emissions by 25 to 45 percent. Experts from the Western Electricity Coordinating Council (WECC) reviewed the study. A 2014 follow-up study did not identify any fundamental reasons why the Western Interconnection cannot meet standards for transient stability and frequency response – two key factors in maintaining reliability following a disturbance on the grid – at similarly high levels of wind and solar. Reviewers of the 2014 study included experts from the California Independent System Operator (CAISO), Electricity Reliability Council of Texas (ERCOT), North American Electric Reliability Corporation (NERC), and WECC. Eastern Wind Integration and Transmission Study: A 2011 NREL study found that that it is technically feasible for wind energy to provide 20 to 30 percent of the electricity requirements of the 38-state Eastern Interconnection region in 2024, with significant expansion of transmission. It concluded that “wind power could provide a highly cost-effective means of reducing carbon emissions.” The study was reviewed by experts at the Federal Energy Regulatory Commission (FERC), NERC, MISO, NYISO, PJM Interconnection, and Southwest Power Pool. California: A 2014 study concluded that “it is technically feasible to integrate 40 to 50 percent renewables” in California by 2030, with technical input from CAISO. Michigan: Recent studies by the Michigan Public Service Commission and UCS found Michigan can achieve or exceed 30 percent renewable energy by 2030. Minnesota: Analyses by UCS and the Minnesota Department of Commerce, the latter in partnership with MISO, show the Minnesota can do 40 percent by 2030. Looking further down the road, a groundbreaking study found that the U.S. can generate 80 percent of its electricity from renewables by 2050 using existing technologies, with as much as half coming from wind and solar, while reliably meeting electricity demand across the country every hour of every day, year-round. A 2015 survey of 1,400 independent energy experts from 70 countries found more than 80 percent agree an electricity system powered by 70 percent renewable energy is achievable by 2050, and nearly half believe it can be done by 2030. And emerging energy storage technologies are also poised to make it possible to store electricity for use when the wind does not blow and the sun does not shine.